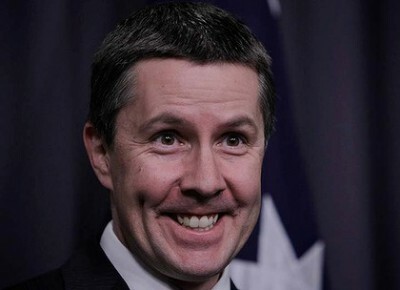 Labor’s Mark Butler: behind the stupid grin lurks a heart of stone. Labor have long ceased to be the “workers’ party – instead it’s all about power – and the only way to cling to power is access to fat piles of cash. The Union (Industry) Super Funds – controlled by the likes of former Climate Change Minister, Greg Combet and his best mate Garry Weaven of Pac Hydro fame – into which hundreds of $billions of union members’ money is siphoned – have thrown $billions at wind power outfits (see our post here) in an effort to cash in the greatest wealth transfer in the history of the Commonwealth (see our post here). And it’s that cash that gets fed back into Labor’s war chest and that fuels its political machinery. For the “modern” Labor party it’s all about easy money (at power consumers’ expense), control and power – and to hell with the worker (see our post here). Thanks to the ludicrous subsidies filched from all Australian power consumers – and pocketed by wind power outfits under the LRET – thousands of REAL jobs are under threat (see our posts here and here) – and Aluminium smelters are as good as finished (see our posts here and here) – but Labor couldn’t care less. The Greens have followed Labor’s lead – knowing full well on which side their bread’s buttered. Not having Unions in their back pocket – and with no Super Funds to milk – the Greens have gone direct to the source: filling their campaign slush funds with $millions from Danish fan maker Vestas and wind farm developers – like Wotif entrepreneur Graeme Wood – who threw a pre-election donation to the Greens which was the largest political donation that has ever been given to an Australian political party (see our post here). Labor and the Greens have united to bury any effort to call the wind industry to account – and run a constant smoke-screen of blatant lies and half-truths designed to deflect attention from the greatest environmental and economic fraud of all time. But at least one “Old” Labor man – Martin Ferguson – has had the temerity to step out from behind the “green” power hypocrisy and hyperbole that has overtaken reasoned analysis of Australia’s energy policy. Here’s a piece penned by Martin that featured in The Australian. 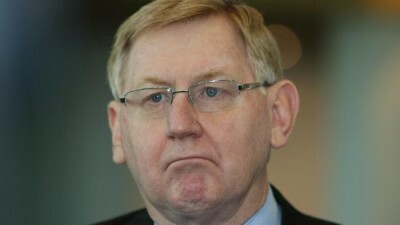 Martin Ferguson: from an era when Labor really was the workers’ party. THE hypocrisy and bald zealotry that often masquerade as energy policy “debate” in Canberra have been of an unusually high quality of late. The “Climate Pact” signed by the USA and China to reduce greenhouse gas emissions appears to be the root cause. It’s fair to say the Greens and their boosters have used the USA-China accord as a stick with which to beat pretty much anyone outside of the renewable energy sector. Their rhetoric is symptomatic of a broader malaise; our increasing inability to listen to, analyse, and properly understand the words and numbers underpinning complex policy. Slogans should not be a substitute for serious discussion or critical thinking. The question I would like answered, is whether the Greens and the wide array of energy dogmatists who cheer them on, actually understand — let alone support — any of the energy technologies that underpin the capacity of the two global superpowers to enter into the “Climate Pact” in the first place? The People’s Republic of China has 22 nuclear power reactors operating and a further 26 under construction. Additional reactors — enough to triple nuclear capacity to at least 58 gigawatts by 2020 — are planned. As a rule of thumb, a typical new-build reactor will generate about 1 gigawatt a year, so it appears there are quite a few new Chinese nuclear power plants on the drawing board. This will raise the percentage of China’s electricity produced by nuclear power from the current 2 per cent, to more than 7 per cent, by 2020. Thereafter, another threefold increase in nuclear capacity (to about 150 gigawatts) is planned by 2030; and then more again by 2040. Not only does nuclear power offer an enormous opportunity to Australia’s uranium exporters, it clearly has a central role to play in China’s decarbonisation. Yet the last time I checked, the Australian Greens were trenchantly opposed to the use of — let alone the further development of — this major energy source. Of course, they are not the only people in Canberra to hold such a view. Hydroelectricity is also incredibly important to any future reduction in China’s emissions. Hydro is the world’s leading source of renewables-based electricity and in 2012, it produced more than twice as much power as all other forms of renewables combined. In China, hydropower has long been the single most important source of renewable energy and it will remain so in 2040. China last year brought online a record 31 gigawatt of hydropower. And while the country’s investment in hydro will fall after 2020, this is simply because most of the suitable hydro sites will have been by then developed, not because better or cheaper renewable technologies will have become available. Hydro will still account for about 40 per cent of total energy produced by renewables in China in 2040. As a party who owes its parliamentary advent to an anti-dam campaign, it is hard to see how the Australian Greens could change the party’s opposition to China’s — or anyone else’s — dam-building. Now let’s look at the USA; a country that is already leading the world in the field of carbon reductions; with emissions today back to levels last seen in the mid-1990s. It is an astounding achievement, but not one born of a carbon price or a Renewable Energy Target. Rather, it has been the rapid and dramatic discovery and use of cleaner burning indigenous natural gas supplies that has cleaned up the American power system. The scale of the USA shale gas expansion is immense. In the few years immediately following the technological advancements in hydraulic fracturing and horizontal drilling that made vastly more resources commercially available, the price of gas fell from more than $13 per gigajoule in 2006, to less than $4 today. Gas use has soared and gas has displaced coal as the country’s leading energy source. The United States today has 487,286 gas wells in production; a staggering number. And throughout 2014, more than 300 drill rigs have been drilling for gas across the US. The International Energy Agency (IEA) says that in 2040, gas will provide more energy to the USA than coal, wind and solar combined. And what do The Australian Greens say on natural gas development? They oppose it. Lastly, the IEA forecasts China will remain the world’s largest coal user in 2040 — with consumption three times that of India, the world’s second-largest user. Not surprisingly, the IEA says carbon capture and storage (CCS) is an essential mitigation technology. As part of their “Climate Pact” the US and China aim to use advanced coal technologies, including a major CCS project in China. The Australian Greens? In 2011, they insisted CCS be excluded from the $10 billion Clean Energy Finance Corporation, set up with the Gillard Government. Energy security and climate policy are areas of complex policy. “True leadership and real action” is indeed required. But it actually consists of sophisticated thinking and rigorous debate; not opportunism. Not only are the Greens and Labor stupid when it comes to consistent and meaningful energy policy, they’re nasty too. Labor spokesman for “Lining Labor’s Pockets at Your Expense”, Mark Butler and his buddy, the Green’s leader, Christine Milne held a wind farm “love-in” last week in the trendy-suburb of Hindmarsh, on the western edge of Adelaide, South Australia. Not content with lying (or refusing to go anywhere near the real costs of wind power) to a crowd of starry-eyed idiots – Milne and Butler took to the usual tactic of deriding and ridiculing those unfortunates who are forced to live in sonic torture traps – being belted night-after-merciless-night with turbine generated low-frequency noise and infrasound (see our posts here and here) – to the laughs and cheers – yes, that’s right – LAUGHS and CHEERS – of their audience. What Milne and Butler didn’t reckon on was that there just might be people in the audience who were not only alive to the very real suffering of wind farm victims – but who were hip the scale and scope of the greatest fraud of all time. One of them is Marina Teusner from SA’s iconic Barossa Valley. Marina has been the voice of reason for the solid local group dedicated to killing off Pac Hydro’s threat of turbine terror for Keyneton (see our post here). At a renewable energy public forum in Adelaide yesterday, (Nov 19th) I witnessed Greens Senator Christine Milne and the ALP’s Mark Butler publicly deride all the people who are forced to live with the impact of industrial wind turbines. The audience, mostly from the suburban seat of Hindmarsh, laughed, clapped and cheered in support of this mockery. For two hours, I listened quietly and sadly to their cries for more and more turbines. After the formalities, I asked some of those people if they had ever seen a real turbine or spent any time in an area or home surrounded by them. None had. I asked them if they were specialist acousticians who understood the emissions of wind turbines. They were not. I asked them if they had any understanding of what keeps their lights on when wind power collapses hundreds of times each year. None did. I asked them if they were aware of the environmental destruction looming in the Barossa and Mt Lofty Ranges – with a 45km stretch of enormous turbines planned. They were not. I asked them if they’d be prepared to have turbines near them, perhaps along the Adelaide coastline. They were not. I asked them if they understood what a power purchase agreement was, and the difference between wholesale and retail power prices. They did not. I asked Mark Butler why his party insisted on pouring billions of taxpayer dollars into intermittent, chaotic power. He didn’t answer me. 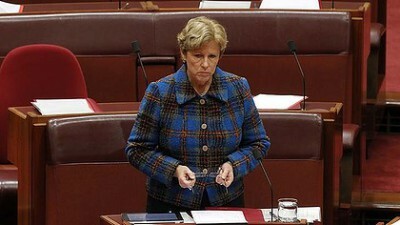 I asked Senator Milne if she’d personally set the example by living only with the power that wind and sunlight provided. It would mean a significant shift in lifestyle and luxuries. She wasn’t keen on that idea. These politicians were playing to an audience who seemed to have no idea about what they were supporting. Christine Milne and Mark Butler were depending on ignorance – and they got it. They used decent country people as their punching bag. It was yet another dismal and irresponsible performance in Australian politics. policy, she does nasty just as well as she does stupid. to take the law into their own hands, in an effort to defend themselves and their communities all over the world (see our posts here and here). And it’s lies and contempt, just like that, that has potential turbine hosts tearing up their contracts with wind power outfits to avoid the suffering they would have been paid to suffer themselves and to inflict on their unwilling neighbours (see our post here). It’s bad enough when those that govern us become indifferent to the reasonable concerns and demands of those they’re paid handsomely to represent – the very integrity of the institution of government suffers. But when that indifference turns to open contempt (as exemplified by Milne and Butler’s shameful performance at Hindmarsh) it isn’t long before ordinary people become fed-up, grab their pitchforks and revolt. Far from cementing “support” for wind power – the high-handed arrogance of people like Christine Milne and Mark Butler is guaranteeing that reasonable people – those still gifted with insight and empathy – will take a solid and permanent set against the wind industry – and the band of rent-seekers that filch $billions in subsidies at our expense, while merrily causing untold human suffering and misery along the way. And the wind industry, its parasites and spruikers – not the sharpest tools in the shed – wonder why the cross-bench Senators moved to set up a select committee – with the express objective of putting the blowtorch to the great wind power fraud – and have banded together to hatch a plan that’ll kill the wind industry stone dead (see our post here). The end can’t come soon enough. There are more examples of the hypocrisy of the Greens – not only in wind turbines but also in live cattle export business that I am involved in at Portland. Butler and Milne are worse then scum bags, when they hype up people when they have no idea what the fans are all about. To be honest we have always known that the windweasel greentard goons are like that, belittling decent people. These goons could end up behind bars for torture, before it is all over, and I hope that is where they end up, and with all their mates. Today, with the death of Australian cricketer Phillip Hughes, it appears to me as a time to reflect how fragile is our grasp on existence. How much one would sacrifice to have him back, if he perchance, was part of my family, my loved one, my friend? 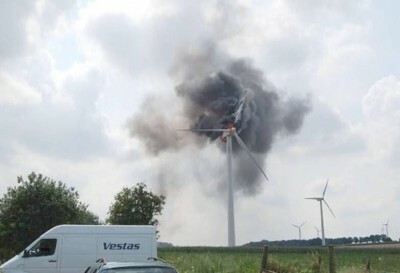 I know that wind farm proponents know the damage that they are causing to innocent people and I would think that they would not like harm to come to their loved ones. A great sadness that has haunted me, with regard to the proposed Ceres wind farm, is that my neighbours who have known me all of my life have such callous disregard for me and mine for the sake of what appears to be an easy buck. I know that they are not ignorant of the ramifications of IWT’s as they have had the gall to publicly state that they will simply move to a house away from the turbines. But, I wonder if they comprehend a nation mourning for a young man by the name of Phillip Hughes. The contempt shown by the trendy left wing progressive ‘elite’ epitomised by Milne and Butler demonstrates the hostility these people have for all ‘ordinary’ people whom they actually despise. Milne and Butler are no doubt very intelligent but they don’t use it in any positive way, their whole agenda is to denigrate those who just go about their business as citizens making a living and interacting in the society of which they are part. To Milne and Butler these citizens are just someone from whom they can take money for themselves and their mates without any regard for society or the wealth creators that live in it. Appealing to their better nature doesn’t work because their objective is to destroy those they see as fair game. I too have been the subject of the same sort of ridicule as Marina Tuesner has, and to a person the ridiculers have been totally ignorant in respect to the technology of wind farms, the ridiculers have been so far removed from the reality of wind farms and so smug in their urban environments that they couldn’t care less. The reality of wind farms is, however, such that eventually the ‘truth’ will permeate the minds of ‘ordinary’ Australians and they will call the industry to account. Meanwhile, the Butler’s and Milne’s will peddle their nonsense, but the problem is they are wrong and accordingly the time will come that those laughing with them today will desert them. I make a distinction between intelligent and intellectual. A person may be intellectual but not intelligent i.e have the “book learning” but not the nous. In the Navy, we had (probably still do) an expression for someone who was a bit on the obtuse side – it was CDF and stood for Common Dog F….! I would suggest that Milne and Butler are seriously lacking CDF. Milne and Butler literally talk piss and wind. But then, that is their calling, when one is being paid by the wind industry, and the other beholden to it in order to shore up the union super funds which are irretrievably invested in the wind industry subsidy rort. They care nought for the rural neighbours lives turned upside down by wind turbines, victims of their Big Wind mates’ Human Rights abuse in the name of profit and greed. This article explains the manner in which true NIMBYism is the corner stone of Labor and the Greens. Its OK to despoil, degrade and denigrate others but don’t put us in the same danger is their motto. Even as far as the USA and China – they ignore that they are using methods to produce energy which they demonise here – NIMBYism at its most evident. No mention by Milne or Labor of the 1,000’s in China who have lost homes, farms and lives to the building of massive Hydro dams – yes I believe Hydro has an important role but not at any cost. Likewise the ‘unconventional’ gas the USA are selling cheaply to push a recovery after the GFC rort on the world, which they created. The gas which has caused huge health and environmental problems. While the Greens argue against this form of mining they ignore it is such an important part of USA’s emissions reduction, which they are applauding. Labor would see it happen all over the place here, never mind the damage to subterranean water supply now and for the future of our nation. Standing in front of an audience maligning and ridiculing those who are suffering, those who are concerned about theirs and others futures, those who are concerned about the environment is what these two parties believe to be good policy. Good for whom, the people they purport to represent, those they hope will vote for them, and those from an industry who pay them to do it. These two parties are compromised and unable to extricate themselves from those who they have accepted payment from, those who have bought them ‘heart and sole’. Those who believe the concept of Democracy, the concept of everyone is equal, everyone has a right to live in health and peace is redundant – because they want to make a buck. Thank you STT, Martin Ferguson and Marina Teusner for highlighting the Green’s hypocrisy and ignorance. The Greens and Christine Milne exemplify a values free zone, without honesty, compassion or integrity. Time for Milne to get another job besides the one she currently has working for the rent seeking Wind Industry.